The above info came from Ggultra2764, and was edited by yours truly (contact me). The image came from altoAnime. Mayu is the daughter of a very wealthy couple who constantly travel the world because of their business. When Mayu was 12, she grew angry with her parents because they were going to miss her 12th birthday because of business meetings. Her parents always gave her stuffed animals for special occasions to make up for not being with her. As Mayu rejects the teddy bear her parents gave her, a 16-year old Kaoru reminds her that she's very lucky to have parents who care for her, as its better than having no parents at all. This cheers up Mayu as she takes a very strong liking to Kaoru and keeps the teddy bear along with all the stuffed animals she has to prevent herself from being lonely. When Mayu returns to Japan from England, she applys as a first-year student at the same college Kaoru was attending. Upon first meeting Kaoru after having a fight with Tina, Mayu jumps up and kisses him. This is quite a shock for the onlooking Taeko and Tina. Then, Mayu invites Kaoru to spend the night at her house, to which he reluctantly agrees. When Aoi overhears this detail from Taeko, she grows shocked about it for a short time, but forgives him. Because of her luxurious life, Mayu can often be quite snobby unless she's around with Kaoru. Mayu is in love with Kaoru, though she's unaware that the relationship is one-sided. 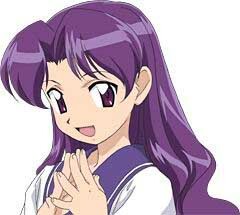 However, Kaoru still likes her as a friend. Mayu constantly argues with Tina about their love for Kaoru. Unlike Tina however, Mayu is more open about her feelings for him.